The Anniversary blend, one of the leading products of the Ligurian coffee roasting company for the Italian Espresso, obtains this coveted recognition for the 3rd time. While the brand new Juta Bio UTZ blend, proposed to baristas and consumers less than a year ago and its debut in the world of excellence, has immediately emerged as one of the best Organic and sustainable blends in the world. It’s since 2008 that the Ligurian roasting company has been recognized at the International Coffee Tasting with at least one gold medal as a declaration of excellence for its blends. To “Receiving again the Gold Medal for the Anniversary Blend, after those of 2012 and 2016, is a confirmation of our good work” said Alessandro Borea CEO of La Genovese “It means that we are able to maintain high the quality over time and that the product is always constant. With coffee it’s not easy at all, it’s still a natural product subject to natural variations according to the harvesting seasons. 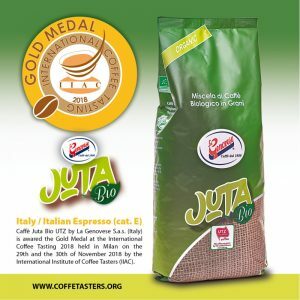 However, this year we are particularly proud of the recognition given to our new Caffè Juta BIO, an high-quality blend 100% Arabica certified organic and UTZ. We have succeeded in creating a product that is the result of responsible and sustainable agriculture, respecting people and planet, with a guaranteed supply chain that respects farmers, workers and their families, helping them to fulfill their ambitions and to contribute to safeguarding the resources of the world. 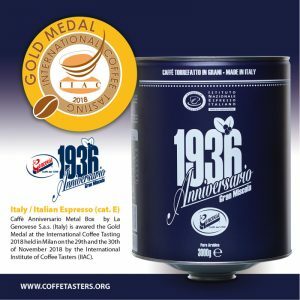 This recognition of excellence rewards not only the taste and the precious aromas of La Genovese blends, but also the quality and passion that has always distinguished the roasting company of Albenga and that has brought it over the years to be recognized and appreciated throughout the all world. The prestigious International Coffee Tasting competition is organized every two years by the International Institute of Coffee Tasters (IIAC). To compete, in the 2018 edition, 322 coffees coming from 126 roasters from 18 different countries. All undergo blind tasting by a jury of internationally qualified experts. Juta Bio UTZ is composed of washed Arabica from Central and South America and is distributed in 1 kg bag in beans. Roasted for Espresso, Juta is a sweet and elegant coffee, with a velvety cream and persistent aromas, with hints of flowers and fresh fruit that leave room for vanilla and jasmine, and with a marked acidity. The Anniversary Blend, distributed in a 3 kg tin, is obtained from a rigorous selection of the best Arabica of the world. Result of a skillful roasting and constant control in every phase of production. The delicate aroma and the velvety body, a very fine acidity combined with a fruity and spicy vein, the hints of chocolate, exotic fruit and tropical flowers, are the basis of this unique symphony of aromas. 100% Arabica made up of natural Brazilian, semi-washed Brazilian, washed Arabica from Central America and Africa. 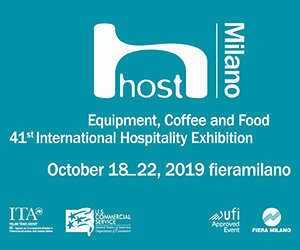 La Genovese flies to Japan!